Népszabadság sold to Mediaworks Hungary Zrt. Hungarian news weekly Magyar Narancs reports Népszabadság – Hungary’s most widely circulated newspaper and the most important of its left-wing dailies – will come under full control of the country’s right-wing media establishment. Mediaworks Hungary Zrt. is owned by Vienna Capital Partners (VCP). Mediaworks Hungary Zrt. was created in October 2014 after VCP acquired publishing company Ringier and much of the portfolio of Axel Springer. 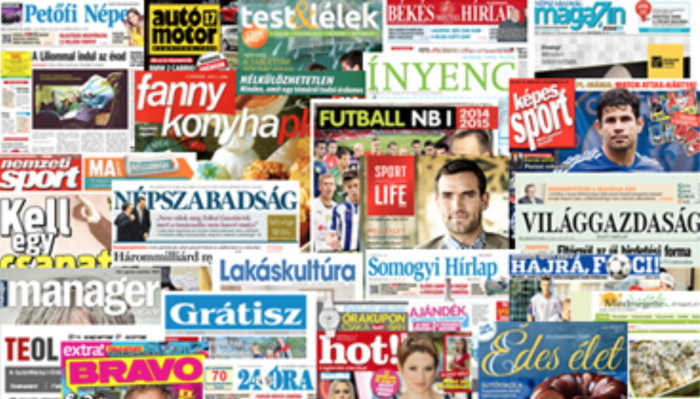 Mediaworks currently publishes over 60 publications in Hungary, including the print version of Világgazdaság (World Economy), Manager Magazin, and a number of county daily newspapers. In early June, news reports emerged that the Hungarian Socialist Party’s (MSZP) Free Press Foundation (Szabad Sajtó Alapítvány) had sold its 27.65 percent stake in Népszabadság to Mediaworks. News of the sale came as no surprise because rumors of negotiations had been known for months. Sources close to the sale tell Magyar Narancs that the cash-strapped Socialist party had been trying to get its money out of Népszabadság for years because the newspaper had not turned a profit since 2008. MSZP then-president Attila Mesterházy was unwilling to sell the left-wing mainstay publication for fear that its editorial direction would change. “The sale had been incubating for years. [The Free Press Foundation] simply couldn’t cover Népszabadság Zrt.’s losses any longer,” foundation president László Kránitz told Magyar Narancs. According to Kránitz, Ringier had offered to buy the foundation’s stake in Népszabadság Zrt. in 2012 but the newspaper`s Swiss owners withdrew from the sale in the last moment. Kránitz did not comment on how much the foundation’s stake actually sold for, except to say that it went for a “respectable market price”. Sources tell Magyar Narancs the amount was somewhere between HUF 90 and 100 million (USD 330,000-370,000). Mediaworks now owns 99.88 percent of Népszabadság Zrt., with the remaining 0.12 percent owned by the editorial board. Nincs már rá szükségük? – Miért adta fel az MSZP a Népszabadságot?, magyarnarancs.hu; 24 June 2015.